I love to write! I’m asked all the time what genre do I like to use. Answer? I’m all over the place. I don’t plan on having a “series” of anything at the moment, I just want the original piece to stand on its own without a follow-up. So far I have at least four other projects in the works and two published novels. My first, and still unpublished, “Port Summerville” is due out next summer and I can’t wait! Recently released and one that I am especially excited about is “Suicide by Death.” It is hard to put into words how you would take a serious topic like this and approach it with humor and wit but maintained a level of respect to those impacted by such a tragedy. What happens when we die? People have asked this question for centuries. Some people have claimed to have witnessed after life revelations, near death experiences. But what if…..? Now that’s the big question, isn’t it? Tony never imagined wondering about the afterlife or this big ‘what if’ question. He was already a successful lawyer with a loving wife and a healthy family. Other than some rare heart defect, he was in perfect health. So it came as quite a surprise when, playing with his boys, he suddenly collapsed and, in Emergency, his heart stopped. The doctors called it, recorded time of death, and scheduled his move to the morgue. But Tony’s body didn’t go through the usual stages of rigor mortis and decay and those close to Tony started experiencing strange events that connected them to the newly deceased or not so deceased. And Tony? Well, he was having a great time playing golf with God, Jesus and Moses. And he was learning, too, learning about what he must do with this newly introduced concept of ‘faith’ that he was being immersed in. And, three days later … well, three is a significant number in matters of faith…. Mark Anthony Waters has a great sense of humor. 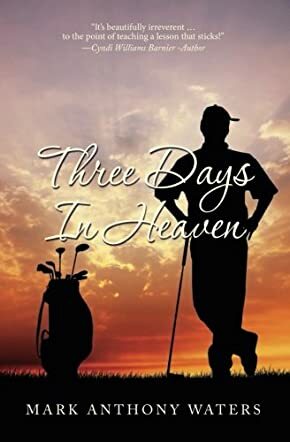 His adventure in the life hereafter, Three Days in Heaven, brings some understanding and perhaps even some hope to the concept that something does happen after death and death is not the all-final-act of life that we all fear. The protagonist, Tony, tells his story in first person, while the secondary characters add their perspective in third person. As the plot develops, the story is told from multiple points of view and the reader can’t help but chuckle at the many bizarre events that keep on happening. But Tony is beginning to understand, at least somewhat, while the others, those still in the realm of the living, continue to be baffled and downright confused right to the end, which, really is another beginning and not an end. A wonderful story to restore one’s belief and one’s faith.